Latin American journalists gathered in Colombia last week to commemorate Gabriel García Márquez’s impact on the profession and share how their reporting is fighting corruption in the region. The Gabriel García Márquez Foundation for New Ibero-American Journalism (FNPI for its acronym in Spanish) hosted a festival in Medellín from Sept. 29 to Oct. 1. The organization is based on García Márquez’s beliefs on journalism, according to FNPI Director Jaime Abello Banfi. The two-day festival had 27 colloquiums open and free to the public, two photo exhibitions, seven workshops, a concert and one ceremony honoring the Gabriel García Márquez awardees. Abello explained during the colloquium that it was García Márquez who founded the FNPI in 1994. Beyond the naming of the festival, his influence as founder of the organization has driven the implementation of journalism workshops throughout the festival’s events. Abello said that Gabo (as García Márquez is affectionately known) thought that workshops were not only helpful, but necessary for journalists. Throughout the conference, Gabo’s pillar of ethics and practice of journalism were honored through other professionals' works and presentations. For instance, Bill Gentile’s talk on Videoperiodismo de Mochila (Backpack Videojournalism) emphasized ethics and practice in this field. He took the audience through the journey of the technological evolution of video and photojournalism emphasizing that although media has drastically changed since the 1970s, the ethics still remain. Gentile, along with many other journalists that emphasized this idea throughout the colloquiums, reminded the audience that a human must always come before a story, a photograph, or a video shot. If no one is helping the subject in the story, then it is the responsibility of journalist to step in, according to Gentile. Fans of Gabo also learned more about his new archive at the University of Texas at Austin (UT-Austin) in the United States. In November 2014, The Harry Ransom Center at UT-Austin announced that it had purchased García Márquez’s archive, which includes original manuscripts, correspondence, photographs, his typewriters and computers and news clippings of his career. With almost 40 boxes of material at the Ransom Center, UT-Austin is set to celebrate the opening of the archive at the end of the month. In 2016, the Ransom Center plans to digitize the documents to share with the rest of the world. Gabriela Polit, a professor at UT-Austin, told festival attendees that UT-Austin had always been interested in García Márquez’s documents and has the biggest collection of Latin American research materials in the country. The Benson Latin American Collection at the university has the largest archives on Latin American Studies and the Ransom Center houses some of Gabo’s favorite authors. Polit says that Gabo’s works will be housed in one of the best destinations for Latin American research and are in good hands. She also emphasized that an archive isn’t just about keeping documents, but about engaging the public and inviting more people to contribute to them. Of the more than two dozen sessions at the festival, a talk about the impact of journalism on corruption and of corruption on journalism gained a lot of attention. 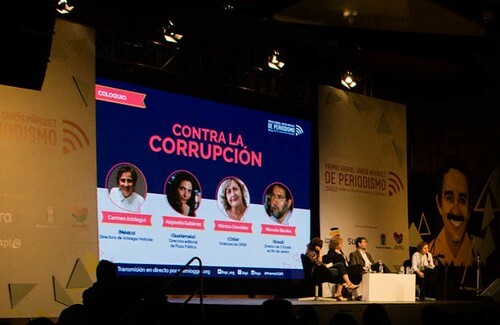 The colloquium “Against Corruption (Contra La Corrupción)” featured a talk with journalists Carmen Aristegui, Alejandra Gutiérrez, Marcelo Beraba and Mónica González. Carmen Aristegui’s participation was historic as she publicly announced that she will make a complaint against the Mexican state before the Inter-American Commission on Human Rights. Aristegui and members of her team were dismissed from MVS radio in March 2015; controversy concerning the grounds for their dismissal followed. Before her announcement, she shared her experiences covering the Peña Nieto house scandal. What started as Mexico’s first lady publicly speaking about a multi-million dollar mansion, led to Aristegui’s team investigating the house and finding out that it was built by a government contractor who had recently won a construction bid to build a rail from Mexico City to Querétaro. Throughout the talk, Beraba, Brazilian journalist and director of the Brazilian Association of Investigative Journalism (ABRAJI for its acronym in Portuguese), spoke on the Petrobras scandal and how, although journalists are fully involved in the coverage, they are not the protagonists in the investigations. The Petrobras scandal is referred to as a political and economic crisis by Beraba. According to the The New York Times, Petrobras unfairly awards oil industry bids involving bribes and political corruption. Beraba pointed out that the investigation signifies that for now, the government institutions are doing their job in investigating the crimes. Alejandra Gutiérrez, editor in chief of digital magazine Plaza Pública, spoke about the protests in Guatemala and the fall of the president. Activists protested corruption and impunity in Guatemala as well as the possible involvement of former President Otto Pérez Molina in La Línea, a corruption scandal where importers paid bribes to avoid custom fees. These events were iconic given that the last time protests on this mass level occurred was in 1973, more than 40 years ago. She says that “we [citizens] lost the fear of going out on the streets” and that Plaza Pública was the main platform covering the events and protests. The festival ended with a colloquium on hip hop and journalism with Telmary Díaz, a female Cuban rapper. Díaz puts journalism in a different perspective stating that hip-hop is similar to journalism because both are mediums through which people report their realities. She also talked about Gabo’s love affair with Cuba and how his work has influenced a generation of Cuban artists. 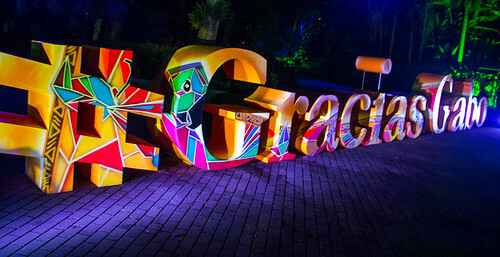 The festival was held in Medellín for the third time and Mayor Aníbal Gaviria Correa announced that the city will bid to host the festival again next year.